Ali's Vantage: KISS - keep it simple STUPID! Usability is crucial for any application. Its becomes more so with web applications, since they're targeted for a userbase expected to have below college level education. This is great news for some of us who do have college level education as we can simply browse and not play mind games when we're focused on other matters. For ages I've been in the enterprise development industry, and boy, are most applications there built to ensure that anyone who uses them needs to first read the big fat(!) manual (RTFM)! This of course is changing as most enterprise users now expect ease of use in the office that they've come to expect using facebook, gmail and yahoo at home. Recollecting an old memory, I was consulting for a big health insurance firm on their web portal for their customers, and we hired a high flying security expert. I guess the expert wanted to justify his "expert" title, and came up with a list of eight (8) properties a password MUST have. I thought he was crazy, but as is the case with consultants, they do have a reputation to live up to. The health insurance firm played along, again I guess someone wanted to justify the cost of hiring the expert. And even during development of the application, I explicitly put in a hack for my password as I just couldnt remember a password with a number, a character, a capital and it being 9 letters long along with a number of other irritating requirements. And oh yes, if you forgot your password, the new one was mailed to you - No, not email, snail mail!! I was glad I didnt have to log into that portal after I was done developing it, and truly feel sorry for its customers. 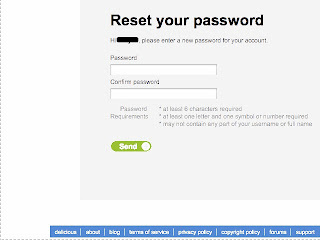 But a few months ago, the password over-engineering zeal came back to bite me. It wasnt some web banking application, it was ..... delicious !!! Yahoo has been the forerunner in usability, but I guess after their acquisition of delicious, they just couldnt beat enough sense into them. Here are two screen shots that explain everything. The above given screen shot shows the crazy password rules for delicious. What were they thinking!! All my URL's are public anyway, its not as if a compromise of my account will suddenly leave me penniless or open them up for liabilities. See where is says "keep me signed in for 2 weeks". Hello ...I dont work for NSA, FBI or CIA. I want to remain logged in for ever and ever and ever. If I ever throw away my laptop, I'll format the drive so please keep me loggggeeeeddd in! Enough of a rant, I've taken action. Moved over to twine, at least their password policy is good. Lets see how their features are. 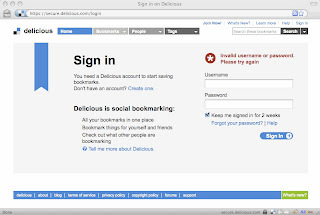 I'm going to miss delicious in the end, if it wasnt for some security wannabe jerk because of whom I had to click on the forgot password after every 2 weeks, I'd still be a user!